We recommend checking out our discussion threads on the Targus 16" Compact Rolling Backpack (Black / Red), which address similar problems with connecting and setting up Rolling Cases Targus. The user manual for the Targus 16" Compact Rolling Backpack (Black / Red) provides necessary instructions for the proper use of the product Computers & Solutions - Tablet & Computer Cases - Rolling Cases. The Targus 16" Compact Rolling Backpack is black with red accents and a blue-lined exterior, and offers a functional way to carry your essentials, wherever you're headed. The bag features quiet roller wheels and a retractable handle, so you can roll it along comfortably. The main compartment has a soft-lined interior pocket specifically for a media tablet, offering protection against bumps and scratches. The roller backpack has a large compartment for storing books, documents and folders. In a separate section, there is a full workstation where you can store all your accessories, key fobs and pens. For additional storage, there are two side mesh pockets -- one is zippered for security. Two elastic straps allow you to stash a change of clothes. And when you want to carry the bag by hand, no worries. There are two shoulder straps for easy carrying that can be tucked away when you're not using them. The fold-away covers act as wheel covers when you're using the bag as a backpack. Another benefit to the backpack is a lightweight form factor. At just four pounds, it's a pleasure to carry and won't add much heft to your daily load. If you own a Targus rolling cases and have a user manual in electronic form, you can upload it to this website using the link on the right side of the screen. MacBook Pros up to 17"
Box Dimensions (LxWxH) 18.2 x 14.0 x 8.5"
The user manual for the Targus 16" Compact Rolling Backpack (Black / Red) can be downloaded in .pdf format if it did not come with your new rolling cases, although the seller is required to supply one. It is also quite common that customers throw out the user manual with the box, or put the CD away somewhere and then can’t find it. That’s why we and other Targus users keep a unique electronic library for Targus rolling casess, where you can use our link to download the user manual for the Targus 16" Compact Rolling Backpack (Black / Red). 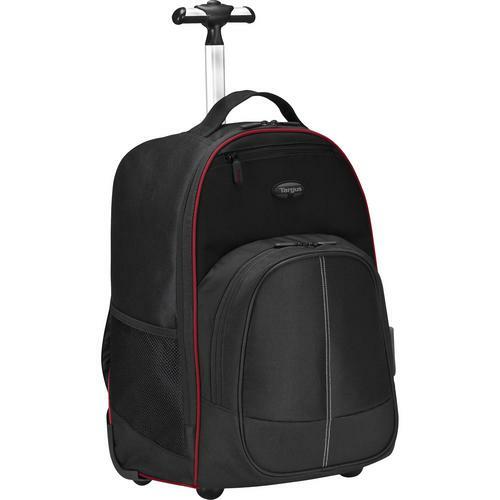 The user manual lists all of the functions of the Targus 16" Compact Rolling Backpack (Black / Red), all the basic and advanced features and tells you how to use the rolling cases. The manual also provides troubleshooting for common problems. Even greater detail is provided by the service manual, which is not typically shipped with the product, but which can often be downloaded from Targus service. If you want to help expand our database, you can upload a link to this website to download a user manual or service manual, ideally in .pdf format. These pages are created by you – users of the Targus 16" Compact Rolling Backpack (Black / Red). User manuals are also available on the Targus website under Computers & Solutions - Tablet & Computer Cases - Rolling Cases.